As part of a Project Management Team, how many times have you thought to yourself, “I love uncertainty in my projects”? Like most of us, the answer is probably “never”. Risk and issue problems and unknowns have the potential to derail even the well-planned project. Unknowns can seem scary, and for this reason, a review of a failed project may reveal a ‘head in the sand’ approach to Risks and project uncertainty, leaving the Project Manager and team unprepared. However, proper insight and planning can help a prevent escalations, and keep your projects on track. This post will discuss some techniques to implement in your projects, whether they are in flight or still in planning phases, that can help you reduce the impact of the unknown. First, we should discuss what Risks and Issues really are, as the distinction between the two is not always clear, and many Project Managers use the terms interchangeably. Understanding the difference can really help you understand the dynamics of your project even better. According to PMI, a Risk is defined as, “an uncertain event or condition that, if it occurs, has a positive or negative effect on a project’s objectives.” In other words, a risk is something that may or may not happen on your project, but if it does, it will have some sort of impact. On the other hand, an issue is “A term used to cover any concern, query, Request for Change, suggestion or off-specification raised during the project.” That means something that is happening right now. Probability– What are the odds that this might happen? Impact– What will happen to our project if this Risk is realized? Understand the options to mitigate the Risk if it happens. There are 6 responses to risk, and it is important to lay out options for Stakeholders. Ensure that a decision is made to implement one or more responses. Avoid– A drastic measure to ensure the Risk will not be realized. This could mean cancelling the project all together. Reduce– Here, steps are taken to lessen the probability of the Risk happening in the first place. Fallback- This is your contingency plan. What do you do if this Risk turns into an Issue? Share- Sharing gains and losses with another party. Accept- A decision to accept a risk means no other action will be taken around the Risk. Put your response plans into motion. Assign someone to own the Risk. This person will monitor the environment, and communicate when the Risk turns into an Issue. You also want to assign someone to carry out the tasks of the response plan. This can be the Risk Owner or other members. 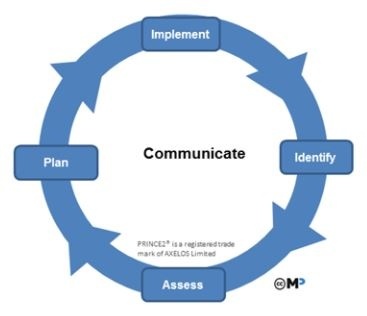 Consistently communicate to your project team and stakeholders about Risks and Issues. Have regular checkpoint intervals for Status Reports, and as soon as an important Issue is raised, or a new Major Risk is identified, communicate to the necessary stakeholders, and take swift action. Maintaining a daily log for each of your projects from Start Up to Close can help you keep track of all the moving parts of your project. Record all relevant information about Day to Day Activities, Identified Risks, Communications, Lessons Learned, Issues Raised, etc… You can use whatever technology works best for you, but the ServiceNow PPM Module can make it simple using Related Lists on your project form. Data entered can easily be reported on, and added to Dashboards for stakeholder communication. If you are interested in learning more about Risks, Issues, and how Cask can help you take better control of your projects, contact us today!